Let's talk a bit about Chicago and hip-hop. A city that in the past has given us Kanye West, Common, and Lupe Fiasco, but if you know anything about it recently it's a much darker territory. Gang warfare and ever escalating violence has led to some of the darkest and most aggressive hip-hop to emerge from its South Side, from the now mostly ignored Chief Keef to the emergent drill scene. This is hard music made by young artists who have seen far too much too young, and while she's more adjacent to it than a part of it directly, the rapper Dreezy whose debut I covered yesterday comes with the scars of that sound. But there's another side to hip-hop in Chicago, a side that is just as touched by the violence but has rebelled with an unrelenting, socially-conscious optimism that seeks to mine some good out of The Windy City. Chance The Rapper is by far the most well-known name, but you also have Donnie Trumpet and Saba and maybe even Vic Mensa in a pinch. 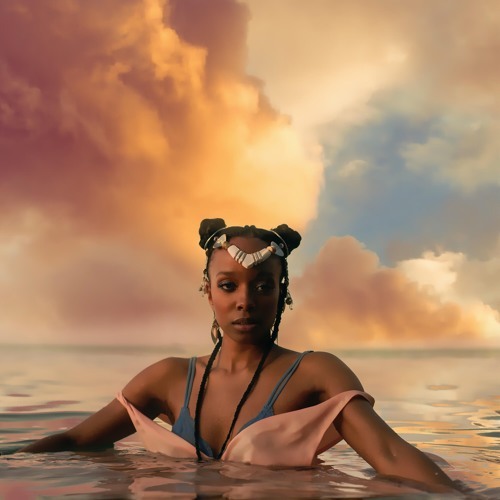 And then there's Jamila Woods, an artist who straddles the line of hip-hop, R&B, soul, and spoken word poetry and who has worked with Chance and even Macklemore. And though I wasn't really familiar with any of her solo work, I liked her contributions to songs like 'Sunday Candy', 'Blessings', and 'White Privilege II', and with the critical acclaim her debut album HEAVN has received, I figured it might be worth a look. Was I right? Well, here's the thing: I don't quite think this album is bad, and I can definitely see it picking up a considerable audience for its grace, layered insight, emotive vulnerability, and focus - and man, I got very little out of it. And that's the frustrating thing: I like and respect a lot of the content and ideas and themes, but the presentation of it all does nothing for me whatsoever; my issues are with more of the music, not the message. And the exasperating thing is that it's not just the production problems that tend to show up across artists affiliated with Chance - this runs deeper, and as such, it's a fair bit harder to articulate. So let's start with that message and theme, which I'd argue is the centerpiece of this record and easily has the most meat and power to it - and yet the presentation is deceptive. A lot of the lyrics and rhyme schemes are set up to resemble meandering nursery rhymes and playground chants, even going so far on 'Emerald St' for a loose interpolation of Mr. Roger's Neighbourhood, which can stand in pretty stark contrast to the systemic oppression that she faces day to day, from deaths at the hands of police as early as 'VRY BLK' to the hard-hitting revolution of 'Blk Girl Soldier', driven by a society wants to fetishize and appropriate black women and their struggles but ignore the actual people beneath it. And it's not just her, either: the city of Chicago falls into the spotlight on 'LSD' where she and Chance The Rapper detail the frustration of so many who want to help or exploit the violence in the city without getting to know or care about the people beneath it. And all of that draws a parallel to what Kendrick described on To Pimp A Butterfly, a collapsed sense of self-worth, which for a shy girl is already fragile and when faced with death in the family and lost love she needs to find a way to rebuild it. And I really do like how she interpolates and reinterprets the chorus line of 'I Don't Want To Wait' by Paula Cole - otherwise known as the Dawson's Creek theme song - to a more literal and grounded definition, which really adds so much more weight than that execrable show ever had. Much of this record focuses on that arc to re-learn to love oneself, and while you could see the childish framework as regression, to me it more rings of reclaimed innocence... at least that's what I thought before I got to the last three of the record, where the imagery takes an abrupt shift skyward, towards space and the heavens as she doesn't feel she truly belongs on this earth. It's an isolationist instinct that makes sense, and I get the subtext about transcendence through finding self-worth, but it didn't quite sit well with me just like when Tyler The Creator did it on Cherry Bomb - removing yourself from the situation doesn't impact change, and when you interpolate John Denver's 'Leaving On A Jet Plane' to do it for 'Stellar', it's not a good sign when it doesn't carry the same weight. Granted, it does seem to fit with Jamila Woods' delivery, of which I can't say I like all that much. She's not a particularly expressive singer, and while there are subtleties at certain points of her delivery - and the multi-tracking really is masterfully done, especially on songs like 'Lonely Lonely' - I'm not exactly captivated by her delivery, which has an odd ascetic quality to it. It doesn't really help that most of her vocal melodies can feel a little flat and inert, rarely ever building to points of climax to drive the songs forward, instead coasting in a very mellow, self-contained flow that's warm but can feel a bit tepid - and that's not counting the warble on songs like 'Breadcrumbs' or the title track that I just did not like at all. It also means that Noname, Saba, and Chance all seem to downplay their deliveries to better fit the aesthetic, but even with that I found the level of detail and insight a lot more colourful coming from them, from Noname's blunt honesty to Chance's detail to Saba's consistent optimism even despite everything set against him that still ends up with him getting friendzoned. But if I'm going to focus on any problem on this record, it comes in the production and instrumentation. And sure, I get that the lyrics and vocal lines are the primary focus of these songs, but it's genuinely startling how little melody there is here, and when it is it's nearly always peripheral to the bubbling bass hits and admittedly textured live drums. It's actually startling how often the instrumental melody seems marginalized to the point where I have to think it's intentional, like the bubbly fragments on 'VRY BLK' that barely coalesce to the guitar muffled so heavily on 'Lately' that when the drums break through with greater texture, the guitar does not! Then you have the strings contorted through compression on 'Way Up', or the glossy blur of 'Breadcrumbs' that doesn't blend well with the drums at all and only seems to further marginalize Donnie Trumpet's horn interlude, or how the violin is cut off after only a few bars on 'Emerald St.' for not adequate reason, more evidence of an oddly fragmented approach to many of these songs that never really build to a significant crescendo or swell. Now that's not saying that songs like 'LSD' or 'Stellar' don't make some use of their guitar lines to construct more of an instrumental hook, or how the synth balances a little better in the groove on 'Holy', in the former case with a good skittering beat and some horns, or the buzzing guitar against the sharper drum mix on 'Blk Girl Soldier', which is probably the most hard-hitting song here, but even on songs like 'VRY BLK' where it seems like the textured mix will build to more in subtle swells, it never really happens. And couple that with wild shifts in fidelity of tone from song to song, and I'm left with more instrumental fragments than full-formed songs, albeit well-sequenced to flow well. And here's the thing: I completely understand that this album is not intended for me and will probably resonate far better with its target audience in both message and presentation. But strong enough compositions can transcend that, and I'm not convinced Jamila Woods brought that, especially instrumentally. Like most projects affiliated with Donnie Trumpet and Chance in recent years, it feels patchy, and while I can appreciate a subtler message, this feels more tepid than anything else, with strong ideas but fragmented execution. For me, it's a strong 6/10, but again, I've always been a little cool on this particular production style out of Chicago and if you have more of an affinity for this sort of message and delivery, you'll probably like this more. It's certainly a unique project and one I'm happy I covered - I just wished I liked it more. But for some, I can definitely see this hitting transcendence, so if you're curious, definitely check it out.